Iron Man’s life has been a bit of a pain. He’s had to deal with assassins, arms merchants, kidnappers, and now aliens. It’s not easy being Tony Stark. And now his back-up ditched him after practically starting the problem. Throughout these adventures the bad guys have a bad habit of escaping. 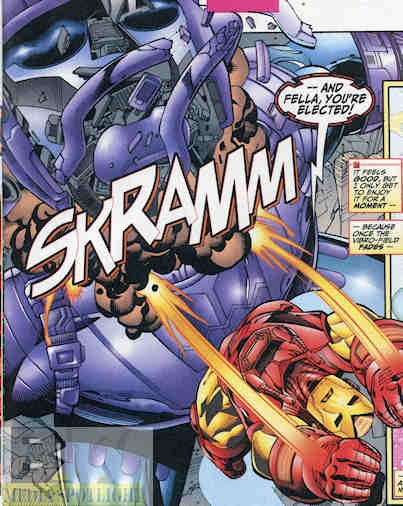 Tonight Iron Man’s not letting this one get away. This one happens to be a Sentinel-sized robot, but that won’t stop him! I already set the stage. Let’s see the performance. Sometimes you just have to hit the villain who’s available. He was also elected president of his glee club. At least this one didn’t get away. Of course his bosses did and a drunken Warbird is pursing them while they’re pursing her. Some days you take the victories you can get. Head to Spacebooger.com and vote for your favorite Friday Night Fight! Winners of these 12 rounds head to the Prize Fight so feel free to join in. We could use the competition. Rules and the previous round’s winners are posted on Tuesdays or when Fred can free up some time. 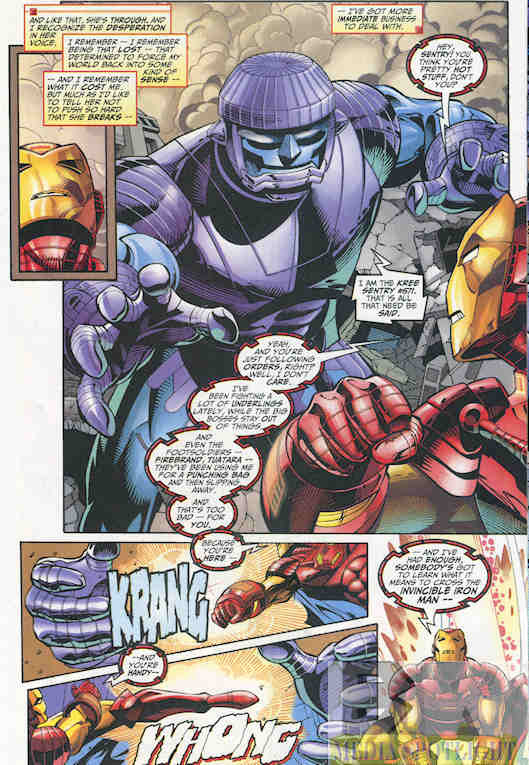 Posted by ShadowWing Tronix on April 6, 2018 in Friday Night Fights, Marvel Spotlight and tagged Friday Night Fights, Iron Man, Kurt Busiek.